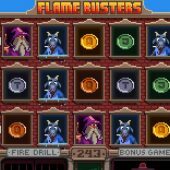 Flame Busters slot is possibly the most unusual you'll see at an online casino. Its full title is actually 'Roasty McFry and the Flame Busters' but for obvious reasons it's listed and known simply as 'Flame Busters'. As you may have guessed the theme is firefighting and Roasty McFry is a Fire Chief although it sounds more like a brand of oven chips you may find in the freezer section of your local store. The game is deliberately retro: you have sound effects not unlike those of the iconic Super Mario Bros video games from the early to mid 1990's and the graphics are of the same standard - heavily pixellated in fact so much so you would likely identify them from a 1980's Commodore 64 or Sinclair ZX81 game. In fact, there have been other efforts to use this styling by iSoftbet with their Megaboy slot, presumably aiming to tap into the nostalgic psyche of anyone that was a teenager in that era. So will Flame Busters extinguish your hopes for the session? The usual 5 reels of 3 rows are set in a building above a Fire Station and at the end of each one you have a Fireman with his hose ready, the reason for which will become apparent shortly. There are 243 ways so no pay lines and the highest-valued symbols are the Wilds and Fire Chiefs at 10x bet for 5-of-a-kind, the Wizard at 5x, monster at 4.5x, robot at 3.5x and dog at 3x bet for all 5. There are no card values so we have coins of varying shades from gold to silver ranging from 1.5 to 2x stake for the 5. The Fire Drill in-play feature is where we now involve those Firemen at the side of the rows. On any spin from 1 up to all 5 of the 5 different coloured coins on the reels may catch fire after landing - the Firemen douse these flames and afterwards all flaming icons will reveal the same icon to hopefully achieve multiple ways of a winning combination. Some 1980's graphics for a very modern 'mystery slot symbol' feature! If you land 3, 4 or 5 Red Alarm Bell scatters in view you will earn 10, 15 or 20 free games respectively. During these you will get the Fire Drill as described above on every spin guaranteed but on the lowest valued of the 5 coins only. You have a set of 3 alarm bells above the grid and as soon as you accumulate all 3 by landing them on the reels as you spin, you move up a floor in the building and continue your free spins with 2 extra spins added to your total. On this next floor another of the 5 coins is added to the first in that it's guaranteed to ignite into a mystery symbol each spin. If you reach the 5th. and top floor you will have at least 2 spins left and all 5 coins now igniting and transforming into the same mystery icon. Some big totals are possible here with multiple ways of the best 10x or 5x bet 5-of-a-kind symbols if revealed as the mystery one.